SWEET POTATO – Vitamin A, Vitamin C, Manganese, folic acid, copper, iron B2 & B6, Fiber and Pantothenic acid – helps stabilize blood sugar levels. BROCCOLI – Vitamin C, Vitamin A, Folic Acid, Calcium and Fiber. CARROTS – Beta Carotene, Essential Enzymes, B1, B2, B6, Vitamin C, Vitamin K, Biotin, Potassium, and Thiamine. ROMAINE LETTUCE – Vitamin A, folate, vitamin C, manganese and chromium, dietary fiber, vitamin B1, vitamin B2 and the minerals potassium, molybdenum, iron, and phosphorus. APPLES – Antioxidants, Phytonutrients, B1 B2,B3, B5, B6, B9 and Vitamin C. Iron, Calcium, Magnesium, Phosphorous, potassium, malic acid and tartaric acid, that can help prevent disturbances of the liver and digestion. CRANBERRY – Antioxidant, Vitamin C and potassium. Some sources list it as having an ability to block bacteria from adhering to the bladder wall, thus preventing bladder infections. BLUEBERRY – Rich in fiber and antioxidants, blueberries are a natural boost to the immune system. 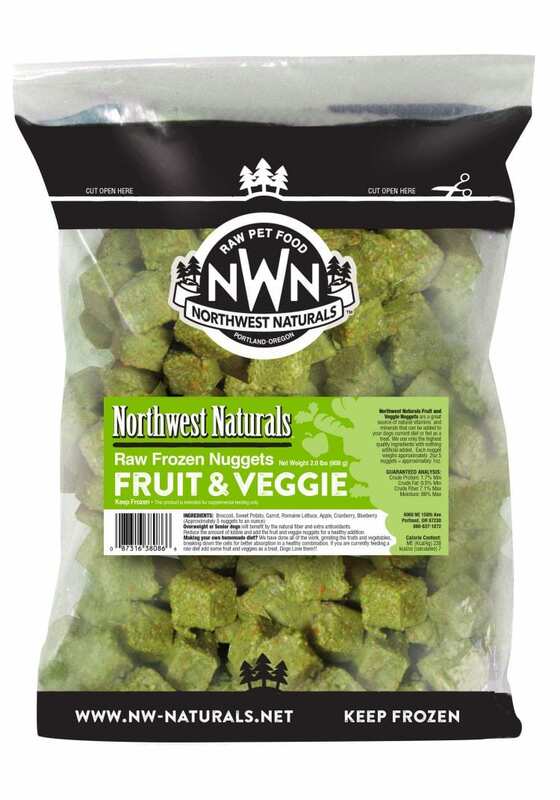 NW Naturals Fruit and Veggie Nuggets are a great source of natural vitamins and minerals that can be added to your dogs current diet or as a treat. Overweight or Senior dogs will benefit by the natural fiber and extra antioxidants. 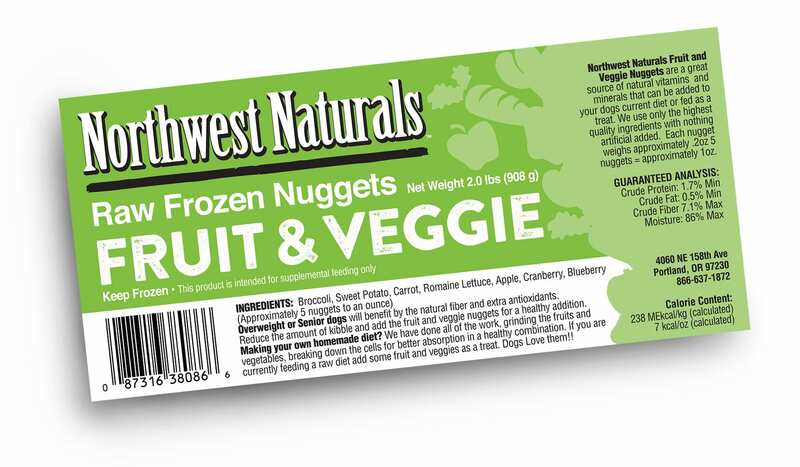 Reduce the amount of kibble and add the fruit and veggie nuggets for a healthy weight control program. Making your own homemade diet, we have done all of the work grinding the fruits and vegetables, breaking down the cells for better absorption in a balanced combination. If you are currently feeding a raw diet add some fruit and veggies as a treat.